"Work it harder make it better do it faster makes us stronger more than ever hour after our work is never over." After a largely great season with relatively few missteps, one that has seen the show revitalised by a new face in the TARDIS and a more subtle approach to long-form storytelling, Doctor Who is faced with the daunting task of trying to end things on a good note. That's something the show has struggled with a lot in the past, particularly when it comes to two-part finales. The typical pattern (which could actually be applied to all two-parters) is that the first half builds to a series of reveals, and in so doing manages to be hugely fun and intriguing, then the second half has to resolve all of them, and winds up being a bit of a disappointment. Based on past form, I'm now really worried for the final episode of the run, because this first half was a blast. Last week, I said that I thought that Danny would be drawn into an adventure this week despite saying that he just wants a quiet life. I was proved right, but not in the way I expected. Danny's death (though that should probably be in quotation marks) in the first five minutes is one of the few times that the show has genuinely shocked me. Clara is talking to Danny on the phone and is preparing to tell him that she has been traveling with The Doctor (which, again, I thought he already knew, but anyway) when the line suddenly goes quiet. After a few seconds, a woman starts talking to Clara and apologising, and a few seconds after that, Clara is running out into the street and looking at a memorial. Yes, Danny Pink was killed after being run over by a car while talking to his girlfriend on the phone. It was sudden, unexpected, and almost tragically normal. Just like any other death. It would have been incredibly bold for the show to leave it at that, and turn the two-parter into the Doctor Who equivalent of "The Body," the heartbreaking episode of Buffy in which a supporting character dies from a brain aneurysm in the opening minute, and the rest of the episode deals with the emotional fallout in an unflinchingly realistic way. Of course, this is Doctor Who, and that doesn't happen. Clearly Steven Moffat will only take his Joss Whedon obsession so far. What actually happens is that Clara, numbed by grief, sets in motion a plan. She takes all of the keys to the TARDIS, convinces The Doctor to take her to a volcano (over his protestations that it's "just a leaky mountain") and proceeds to go all Frodo on him. Knowing that lava is the only thing that can destroy a TARDIS key, she throws one of them in to the volcano each time The Doctor refuses to travel back in time and save Danny. Once she has destroyed them all, The Doctor reveals that he had induced a state of hypnosis in order to figure out what was wrong with her. He then offers to help her find Danny at the point where her timeline and his are next due to meet, which just so happens to be in the afterlife that we have been given glimpses of over the course of the series. So the two little Orpheuses head out on an adventure, which means that The Doctor is finally going to meet Missy. Basically, that shocking opening was just the start of a roller coaster of revelations that the show has been building to slowly over the course of the last ten episodes, and the experience of watching the characters discover what many already suspected - that Missy was actually a regeneration of The Master - was tremendous fun. At his best, Steven Moffat can create a kind of avalanche of storytelling, in which event follows event, with each new discovery increasing the speed and intensity of the whole until you wonder how the episode is going to keep from falling over and being buried. With its myriad twists and turns, "Dark Water" was a great example of Moffat keeping just ahead of the snow. It's probably worth taking a moment at this point to discuss how monumentally (and delightfully) messed up this episode was. Killing Danny in the first five minutes, even if he resurfaces soon after in the afterlife accompanied by Seb (Chris Addison), gives the episode carte blanche to discuss the afterlife and mortality in a way that is initially quite frank, but very quickly takes a left turn into disturbing. Clara and The Doctor learn from Doctor Chang (Andrew Leung), that the afterlife (or 3W as it's actually known) is a kind of storage facility for the consciousnesses of those who have died, and that their bodies are stored in a fluid known as dark water, which preserves them while also acting as an X-ray that only shows the skeletons of the dead, but not the exoskeletons used to contain them. The episode also fleshes out the details of the Nethersphere by showing that there is a psychic connection between the consciousnesses contained in it and their corporeal bodies. To illustrate that point, one man off-screen screams in agony as doctors remove his organs, while Danny, Clara and The Doctor all learn at the same time that those who are cremated basically feel like they are burning alive. Oh, and they force Danny to reveal that he killed a kid when he was in the Army and then have him sit opposite that same child, and experience his fear and rejection. So, yeah, it's a pretty messed up episode all around, particularly when contrasted against the very cheery way that Missy, Seb and Dr. Chang act towards their visitors. Doctor Who has produced scarier episodes, but I can't think of any that produced the same skin crawling effect. Alongside all the revelations, there was the much quieter and more human story of Danny and Clara. Reunited via a wi-fi connection, Clara can't quite bring herself to believe that she is talking to the man she loves, and says that she will do anything to be with him once she knows for certain that he is who he claims to be. Danny, thinking that the only way they can be together is in death, tricks her into ending the call, after which he is presented with the option to "delete" his consciousness by Seb, who Addison plays with the perfect balance between superciliousness and menace. 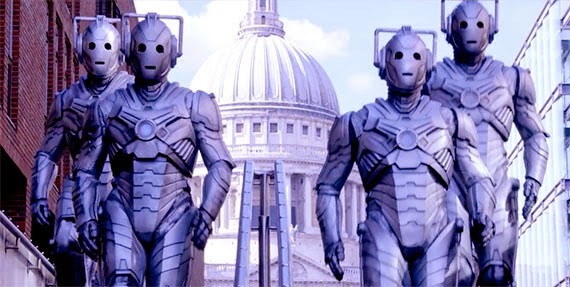 Assumedly, "deleting" himself will cause him to become a Cyberman. Jenna Coleman and Samuel Anderson were brilliant in their scenes, brilliantly conveying their characters' love for each other, and how that same love makes them want mutually exclusive things; Clara wants to be reunited, Danny wants her to live her life. It's achingly sad, and lends an emotional core to an episode that could have got lost in its litany of shocking revelations. Speaking of which: the reveal that Missy was The Master was very well handled. From her first scene, in which Michelle Gomez, clearly having a whale of a time, pretended to be an android in order to mess with The Doctor, the episode built up the mystery of who she was in a way that was playful, and which managed to withhold information without seeming obtuse. While I would contend that the mystery wasn't actually that hard to figure out - The Master is the only major villain that Moffat hasn't brought back since taking over, so the show would have to get round to it eventually (and you don't have to be Alan Turing to crack the code Missy=Mistress=female version of Master) - it was still a satisfying payoff to all the little clues that had been dropped along the way. Except it isn't really the payoff since we still have one episode to go. As a standalone episode, "Dark Water" may have been a giddily enjoyable 45 minutes, but that's because it didn't have to resolve anything; it just had to throw things into chaos. Now Moffat has to take that chaos and somehow stick the landing, which, as anyone who watched the third series of Sherlock will know, is not really his strong suit. "You have iPads in the afterlife." "iPads. We have Steve Jobs." - Michelle Gomez is so much fun as Missy that I really hope they aren't going to kill her off in the next episode. They already squandered John Simms in two sub-par appearances, it'd be a real shame to see them waste someone who so perfectly suits the tone of the show and plays off of Capaldi so well.